A special thanks to Christmas Star From Afar for providing a kit for me to review and one to give away! As always, all opinions are 100% my own. Christmas is my favorite holiday; it represents family and traditions for me. For my family, we attend a Candlelight service on Christmas Eve and then watch A Christmas Story. I always struggle to keep the focus on the true meaning of Christmas, instead of the commercialism that surrounds it. 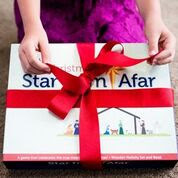 I have recently been introduced to Christmas Star From Afar, a new game that celebrates the TRUE meaning of Christmas. It was created by a mother who wanted to give her children a daily reminder of Jesus during the Christmas season. Even though my son is too old to enjoy this, I have friends and family members with young kids that I would love to gift this to! 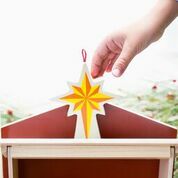 The Christmas Star From Afar encourages kids to search for the star, much like the Wise Men in the Nativity story. Each day, when they find the star, they move the Three Wise Men one step closer to the stable. 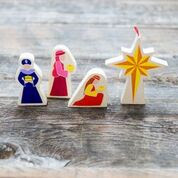 On Christmas Eve, you place the star on top of the stable and on Christmas morning the Three Wise Men find Baby Jesus. You can also opt to read the included scripture or incorporate it into your family traditions. 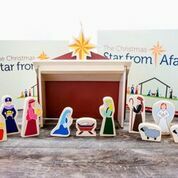 The Christmas Star From Afar kit includes 10 wooden nativity characters, a 4 piece wooden stable, a wooden Star, and a hard bound copy of “The Christmas Star From Afar” book. It also come in a Spanish version and a dark skin version. For more ideas, follow Star From Afar on Facebook, Instagram, Twitter, and Pinterest. Would you incorporate this into your family tradition or give it as a gift? Since I have small kids at home, I would probably keep it! I think your boys would love it! I would give it as a gift! We really don't celebrate Christmas so it would be a bit out of place lol My sister would LOVE it tho!! It would make a great gift for sure! If I would win this giveaway I would give this nativity set to my son to play with and learn about the true meaning of Christmas! He will love it! Good luck! My daughters will just adore playing and learning with the nativity set. Id love to gift this nice set to my 11 year old daughter for Christmas. I would give this as a gift please! It looks awesome! kristiedonelson(at)gmail(dot)com Thank you. 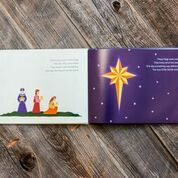 We would keep this, my daughter is 3 and I would love this to bring the story of Christmas alive for her. I would keep this, and use it for my kids for years to come and bass it down to their family. I think my grand kids would really like this. I would keep this. I love it. I will give this to my granddaughters.